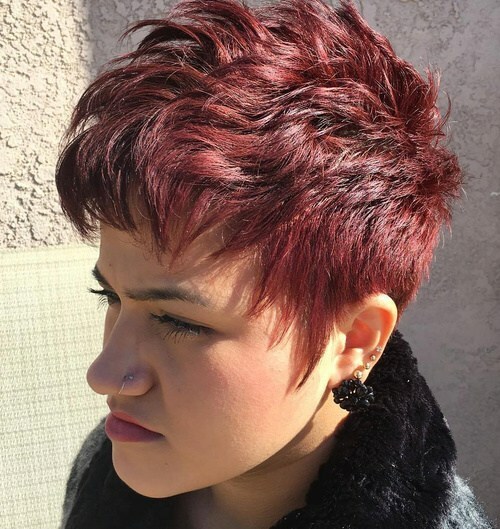 There’s no doubt that short haircuts are at the cutting-edge of hair fashion, because they show-off all the latest cutting techniques. 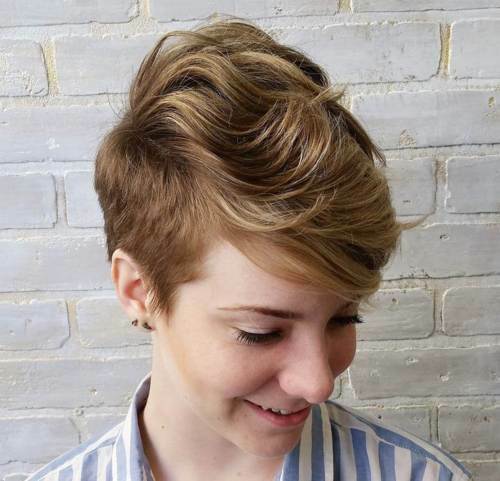 This season’s haircuts are full of interesting and pretty new ideas guaranteed to leave you looking trendy and fresh. As we know, other people gauge our age and personality type based on our fashion choices and hairstyle. Oat-blonde is a neutral fashion shade that’s perfect for anyone who needs to reduce the redness in their complexion. This straight cut on fine hair has sharply textured tips in a short-back-and-sides variation with an extra-long, side-swept fringe. Casually combed forwards from the crown creates texture and movement and I love the latest ‘no black roots’ trend! And this image shows another popular hair color trend that will ‘warm-up’ pale skin tones and highlight an extrovert personality! 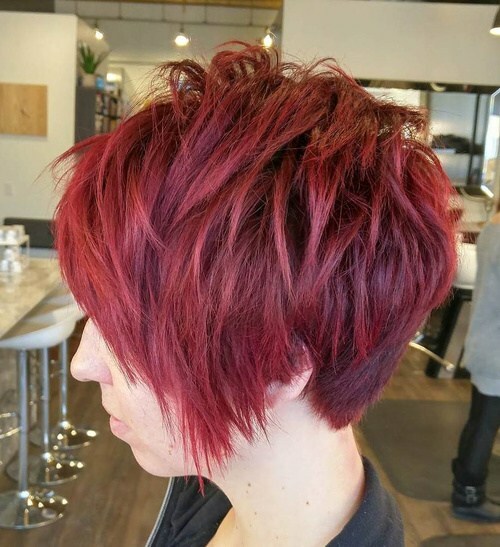 It’s a little longer than the short cut above and shows how medium to thick hair can be styled to create rippled texture that adds volume and shape without curls! Darker skin tones look wonderful framed by deep-red, like this fashionable maroon adding extra style to a high-fashion short style. 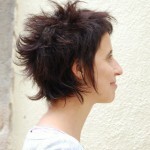 It’s an asymmetric cut for medium to thick hair, with a voluminous stacked-back shown in profile. The uneven bottom edge of the longer side contrasts with the fabulous rounded back in this updated sixties look! 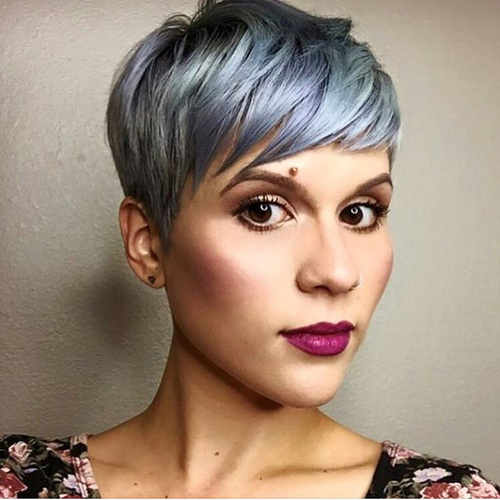 This modern pixie scores highly for sophisticated style and the unique new color design. 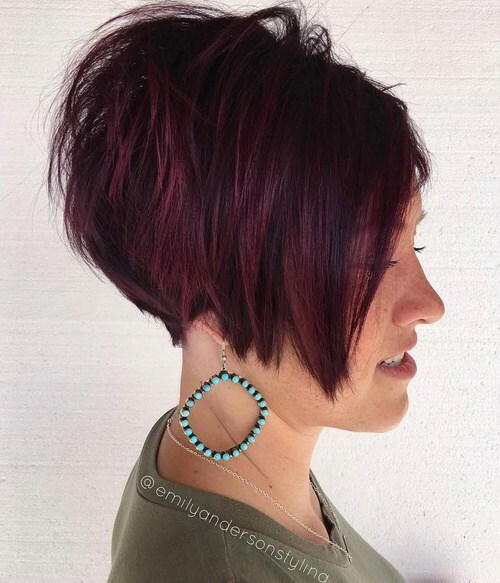 Like most contemporary hairstyles, this is an asymmetric cut with different profiles and side-swept casual bangs. However, it’s also asymmetrical ‘front to back’ with a superb soft gray back and pretty blonde at the front! 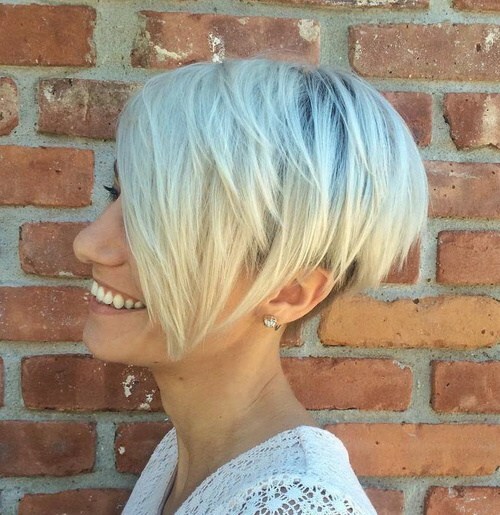 Short straight haircuts gain added contemporary style from a refreshed color scheme. 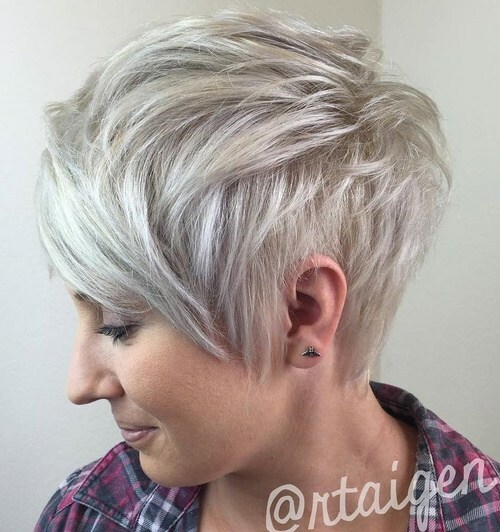 This neutral-silver-blonde over a taupe roots creates the 3-D dimension that makes fine hair appear thicker. The neatly clipped back is a chic alternative for fine hair that’s not thick enough for stacked layers. 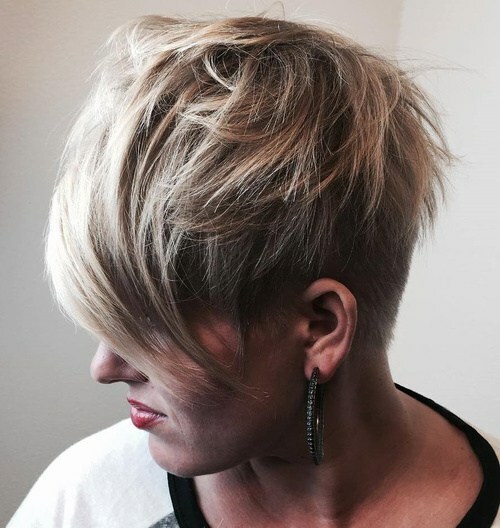 Texture and movement make this forward/side-swept short haircut a highly face-flattering and modern style. This is a great color lift idea for mousey and dark-blonde hair that needs a little touch of gold or copper to warm it up. Neutral blonde highlights can drain all the color from some skin-tones, so choose carefully! The feathered, razored edges of this cute haircut help soften the lines around the sides and forehead. This cut draws the eye up to the top of the face and the lovely, wavy texture on top. This keeps the focus away from a strong jawline that tends to jut out from the rest of the face. Dainty features and blue eyes are beautifully enhanced by a delicate blonde shade. 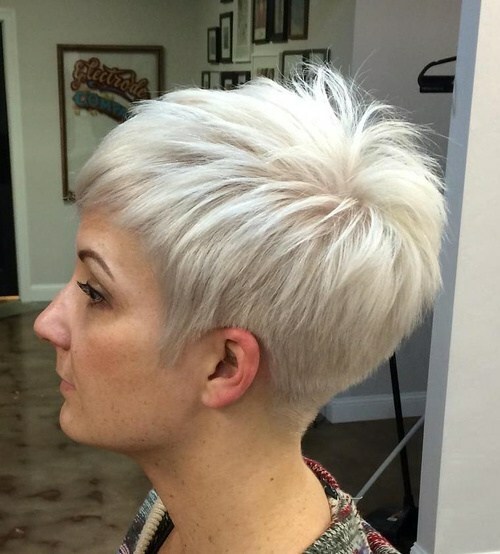 This blonde is more silvery than platinum-blonde and there are no black roots to coarsen the look. The finish is silky and glossy and this design suits fine and medium hair and oval, round or heart faces! 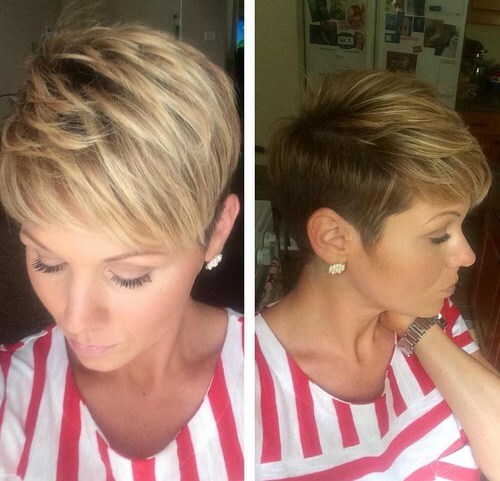 This cut is suitable for thicker hair types and the layering around the head creates lovely circular lines and texture. 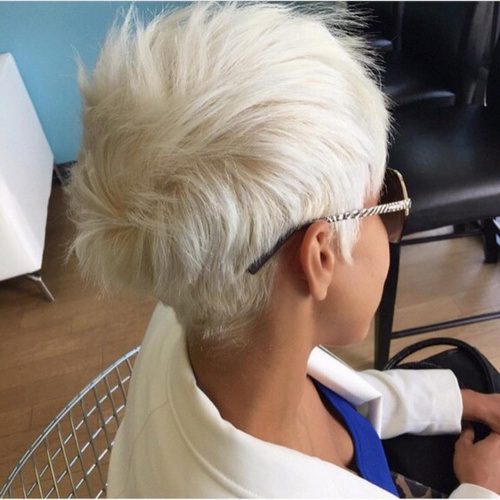 This platinum-blonde is another all-over color – although there’s a hint of pale gray roots in there. 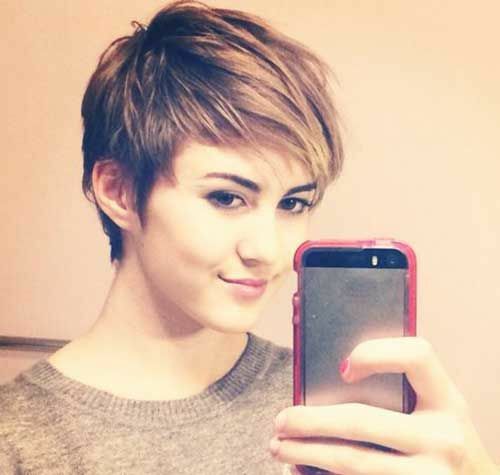 The side-parting is indistinct and short bangs complete this tidy short haircut. 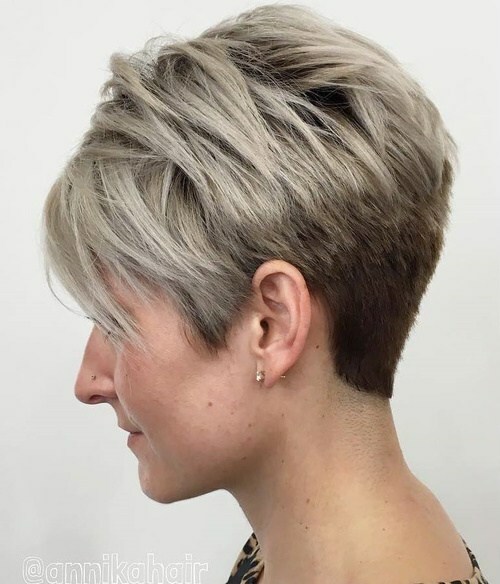 This subtle pink-beige blonde shade is perfect for fine hair and pearl studs accentuate the pearlized finish you can get with white-blonde balayage. 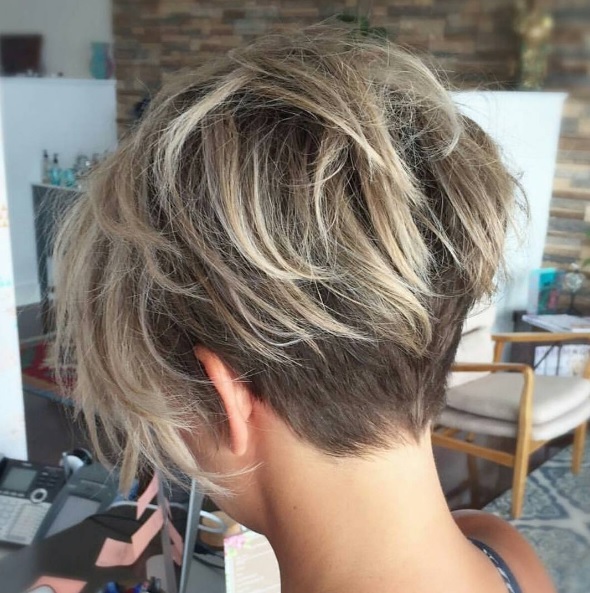 This is a good short haircut for silky hair, with layers that can be ‘fluffed up’ to add volume, texture and trendy forward movement. The back is softly graduated into the nape. If you lighten any hair type to platinum-blonde, the hair-shafts become thicker and coarser. 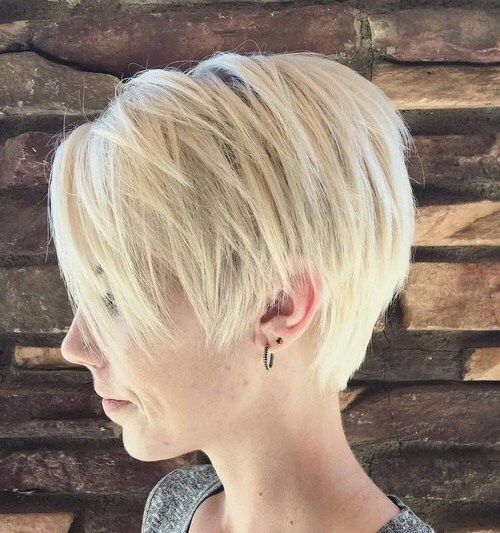 So if you bleach hair that’s already thick and coarse, you’ll get this highly stylish pixie with fabulous circular movement sprouting from the crown. Wear this for a confident and trendy image! 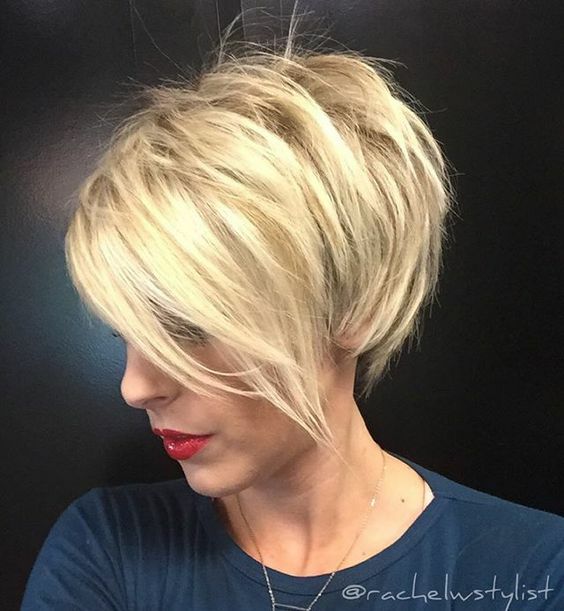 Black roots are great for accentuating stacked-layers in a steeply-angled, short bob. And as black is a receding color and white always seems nearer, this color combo adds the appearance of more density to hair. 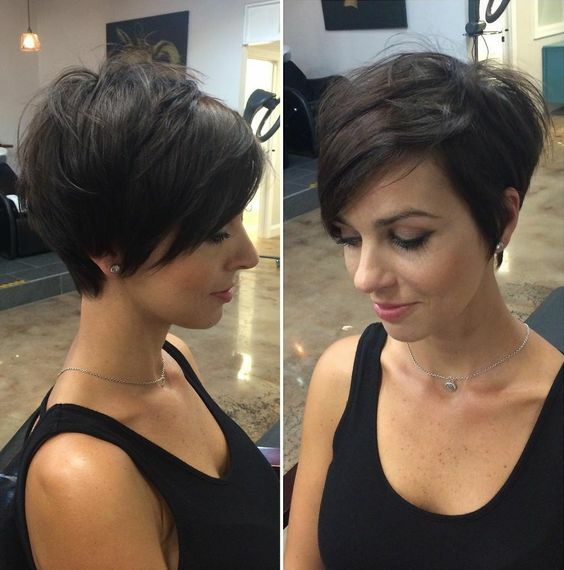 This edgy cut has sliced layers with sharp tips and lots of texture, softened by a few curvy lines! 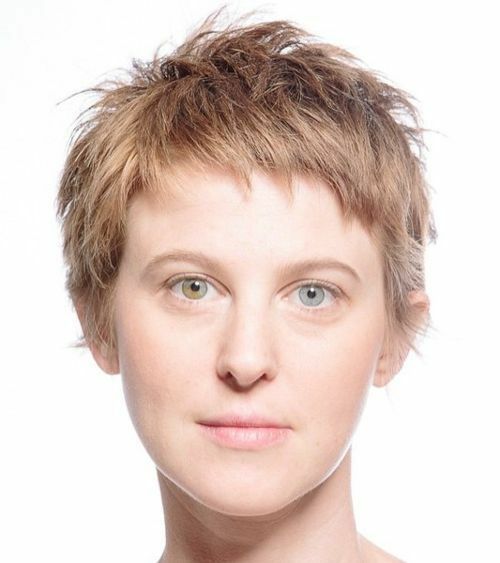 This image shows a cute pixie that’s tailor-made to suit the model’s oval face and fine hair. The fabulous modern color scheme combines pale muted-copper with a cute beige-gray-blonde ombré you can just see at the sides. The hair is tinted in colors that closely match the model’s pretty gray eyes exactly and the result is very artistic and flattering! 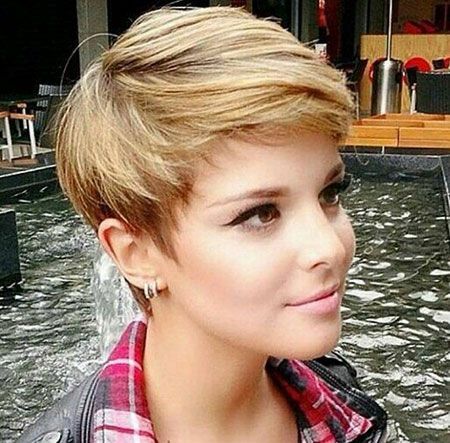 This extreme short haircut creates a confident image by refusing to conform to the stereotype of a pretty woman’s hairstyle! Breaking old-fashioned stereotypes is always a good idea and this razored short-back-and-sides in natural-blonde has lots to recommend it! Short choppy layers create interesting detail at the crown and sharp-tipped, untidy strands accentuate the model’s dainty facial features! Jazz-up your image and shake-up your boyfriend/husband/partner by wearing this super-trendy, silver-gray style. The cut is simple and streamlined, with short bangs and side-points drawing attention to well-shaped brows and huge brown eyes. Strong silver-gray with purple/green gloss suits medium skin-tones. 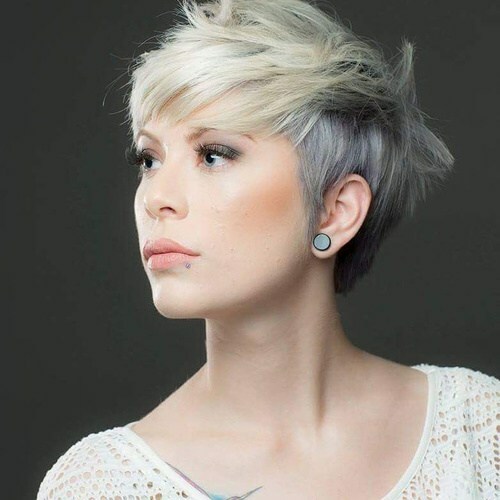 This is a similar hair color idea to the one above, but with lighter silver-blonde shades to suit pale skin-tones. It’s not possible to detail the best new shades for individual readers, but these images are helpful for finding a skin-tone similar to your own and seeing which blonde shade matches well. 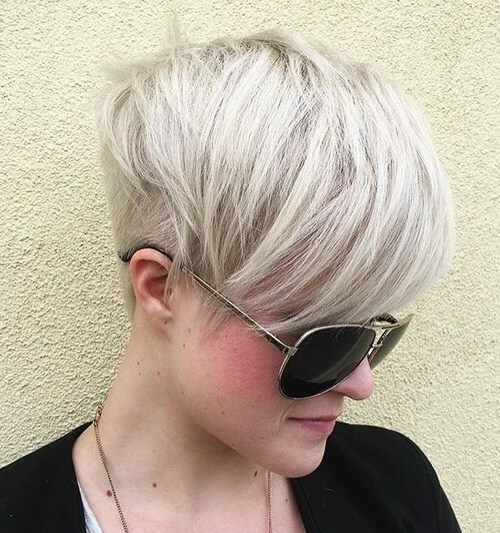 This edgy razored haircut is beautifully balanced by the softness of pale beige-blonde! The back and sides are clipped very short and there’s tousled shaggy detail around the crown. The front hair slides down into long, glossy bangs swept into a curve ending on the cheekbones. Here’s a fabulous look that’s highly fashionable, but not over-the-top. On medium to fine hair you can get silky, flexible movement and cute rippled texture. Long, diagonal, piece-y bangs are soft and flattering and the rich, raspberry-ripple streaks are so chic! 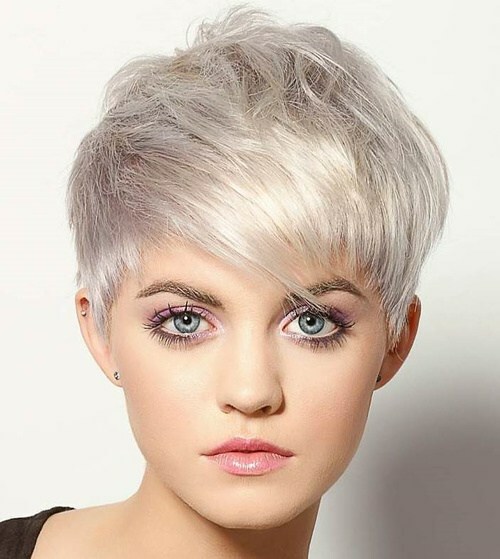 Straight hair with natural body looks edgy in long platinum-blonde layers with gray roots showing it’s a modern look. This hair-color idea does tend to drain color from pale skin-tones, so you may need to wear a little more makeup to get more color definition for your eyes and lips! This fabulous model-girl look is actually easy to get on fine – medium hair and will really rev-up your image! The hair is layered from a blurred side-parting to create asymmetry. 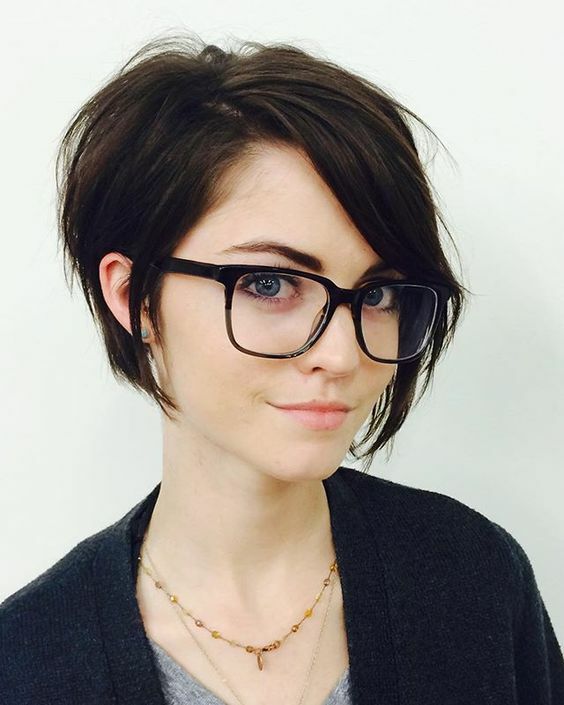 The shorter side has choppy volume and the longer bangs have exciting, disconnected layers falling over one eye. Add daring silver-gray and sixties vintage pink lipstick! 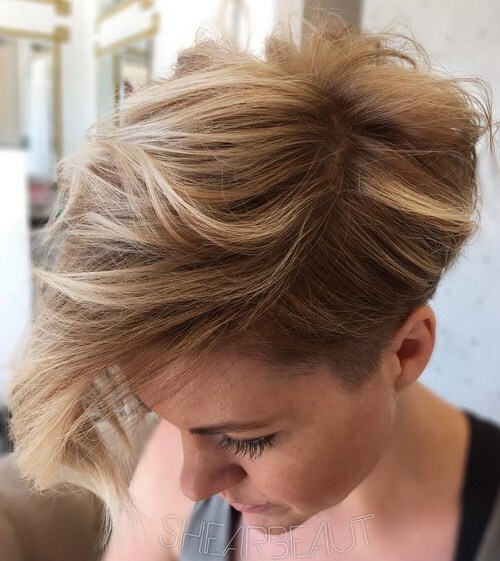 Today’s final short haircut shows how very close tones in dual- or triple-blonde balayage create thicker-looking hair in a fairly natural color. This youthful, asymmetrical cut has extra-long bangs draped over one side and a touch of natural wave to create a nicely curved silhouette! So are you already on the phone to your salon and excited about your new look! Well, as soon as I finish chatting with you about today’s amazing new short cuts and color ideas, I will be! 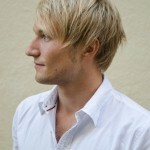 I’ve been dithering for weeks about my next haircut style, but these cuts have helped me decide on my own ‘new image’! Talk soon! So keeping your hair short and contemporary really helps you look younger and more attractive – and it’s so much cheaper than plastic surgery! Light golden brown has returned to be a dominant, new fashion color this year and about time, too! It’s a really attractive, natural looking color and a fresh alternative to ash-blonde, gray and rainbow shades. This pretty style has fashionable asymmetry and swept-over height on top – plus the popular side-swept fringe! 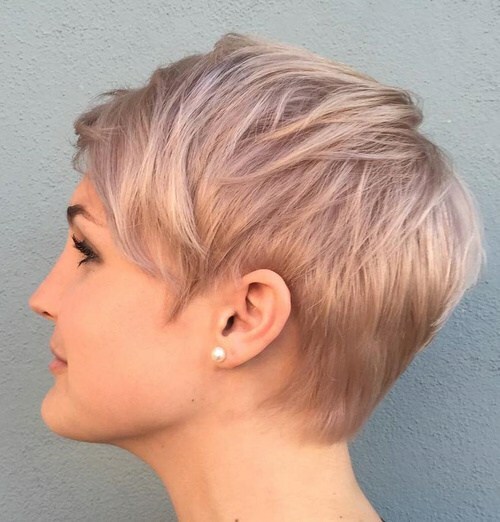 Short pixie haircut for women 2018: This subtle pink-beige blonde shade is perfect for fine hair and pearl studs accentuate the pearlized finish you can get with white-blonde balayage. This is a good short haircut for silky hair, with layers that can be ‘fluffed up’ to add volume, texture and trendy forward movement. The back is softly graduated into the nape. Under: Popular Hairstyles Lively, Textured & Eye-catching: Medium Length Makeover!